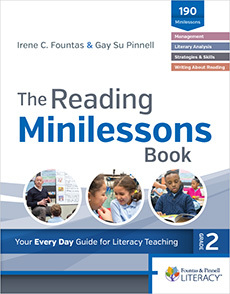 Reading minilessons are short, concise, purposeful lessons with a practical application in a specific area of literacy. Each minilesson engages children in inquiry that leads to the discovery of understanding of a general principle. Growing out of the shared and interactive read-aloud experience and linked to independent reading, teachers use many of the shared and interactive read-aloud texts as examples from which they generalize the understanding of the minilesson. Participants in this seminar will learn more about the values of this powerful instructional context. Participants will learn how to use The Reading Minilessons Book to engage children's thinking through high-quality texts. Understand how to assess and plan reading minilessons.